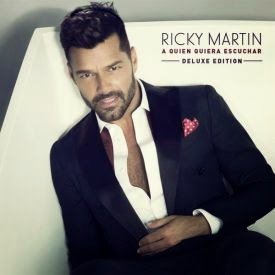 Singer Ricky Martin has released the cover arts for Standard and Deluxe edition of his new studio album, "A Quien Quiera Escuchar". The album is scheduled for release on February 10 and consists of 13 tracks, including the single "Adiós" which also available in Spanish, English and French versions. In April, the Puerto Rican will start his new tour, which already has shows scheduled in New Zealand and Australia.